With the new PAPER data (‘x’s) and a refined fitting procedure we can accurately model the EoR band flux to better than 2%. 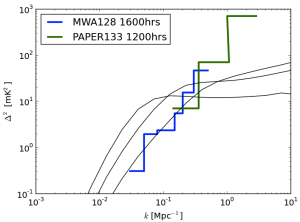 If you look at typical catalogs of sources in the southern hemisphere epoch of reionization band you soon realize why measurements often disagree by 20%. Even the brightest sources one would use for calibration are uncertain. 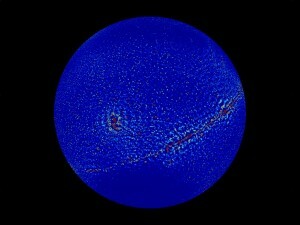 As you can see from the plot to the right, most of the old data (dots) are pretty uncertain. This source (Pictor A) is one of the brightest in the southern sky and is often use to set the flux scale. The flux scale standard everyone uses to compare measurements is based on Cygnus A, which is not really even visible in the south, isn’t even defined at 150MHz. 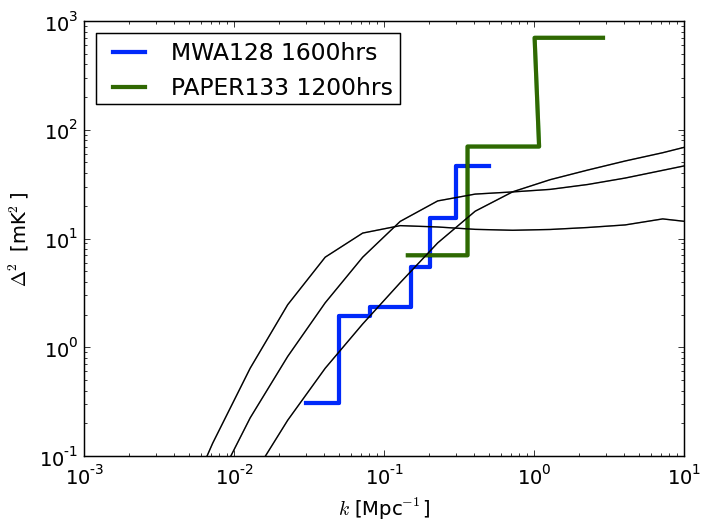 So thats why we took a bunch of PAPER data and measured a bright source (Pictor A) several thousand times. This let us get rid of a lot systematics to get a nice spectrum. Then we fit a spectrum to old and new data using newish fitting procedure that accounts for error bars and nicely estimates the fit uncertainty. Previous estimates put the model uncertainty at about 20% (that number again!) 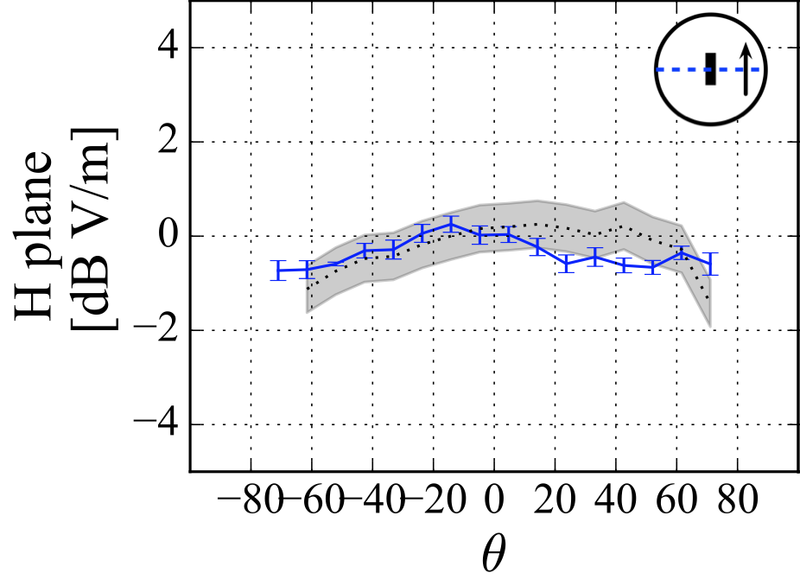 but using the new fitter on the old data we found that we could predict the flux at about the 5% level, folding in the new PAPER data the model precision went below 2%. An order of magnitude improvement! we also verified this method on a couple dozen other sources with good success. Below is a nice large PAPER image of the area we were looking at. 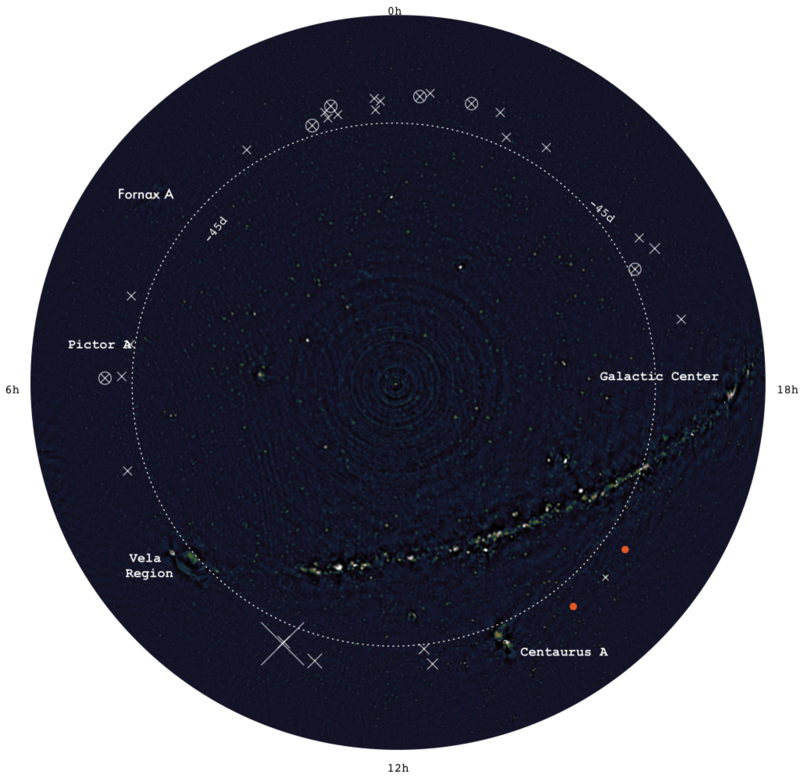 A PAPER mosaic of the southern EoR band sky. Sources measured in this paper have ‘x’s, only two (orange dots) seemed to disagree with other measurements. 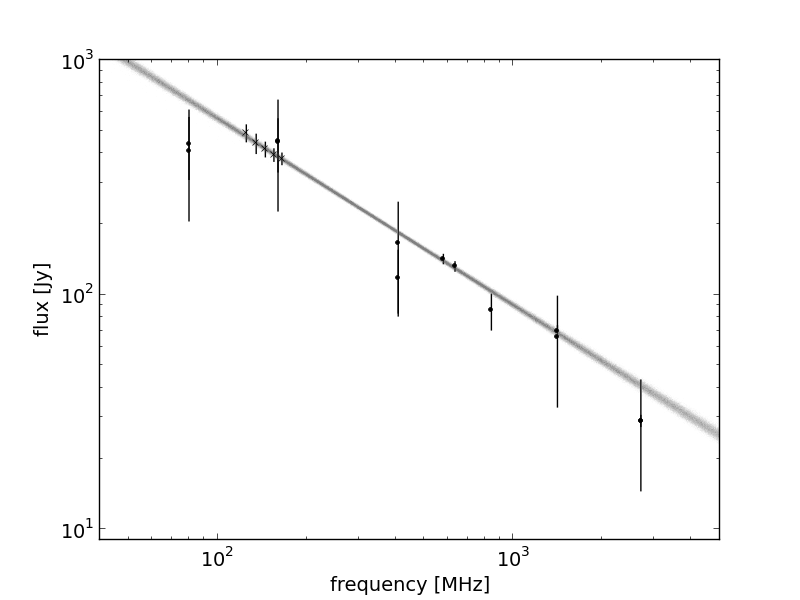 This paper explains the PAPER method for measuring the EoR power spectrum. 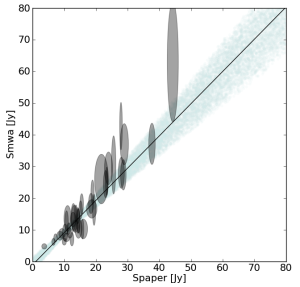 While some experiments plan on subtracting foregrounds, PAPER will stick to uncontaminated regions of power spectrum space. Narrow field simulations had previously expected this region to have little dependence on baseline length. 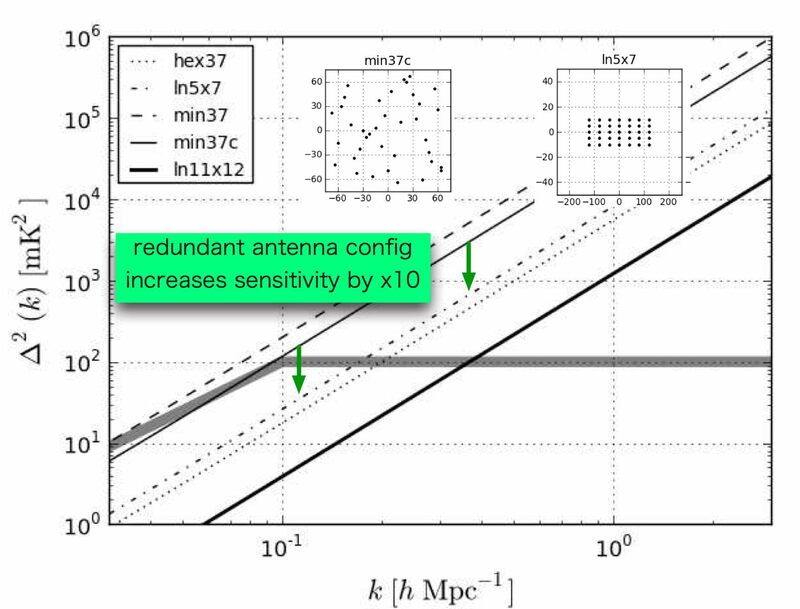 This paper explains why in the wide-field case, foreground contamination gets worse with baseline length. 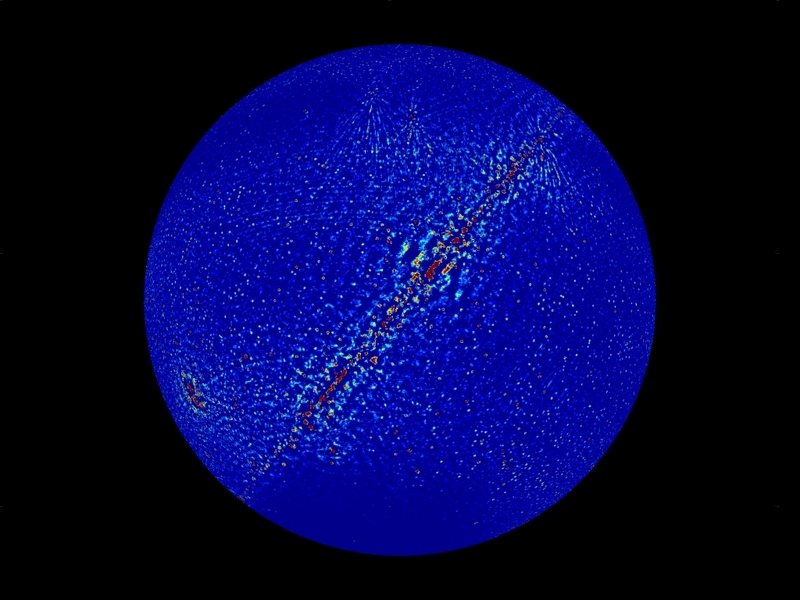 The PAPER strategy is to avoid this regime by concentrating sensitivity in a very dense array but sample longer spectral modes. In all this results in a comparitively lower SNR measurement (see right) but with better understood noise. 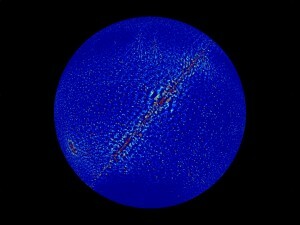 PAPER will soon be performing long integrations to the power spectrum of high redshift Hydrogen. What is the best configuration? In the process of answering this question we also carefully (re) derive the relationship between the output of an interferometer and the power spectrum. This settled (for us) some open questions about units and hopefully is another step towards building a stable bridge between theory and measurement. 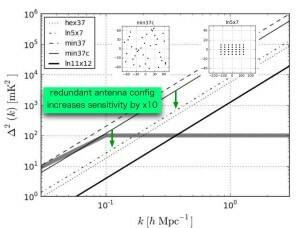 However the takeaway is that, in the limit of a sensitivity starved interferometer trying to detect Fourier modes, a grid configuration can gain almost an order of magnitude in sensitivity. 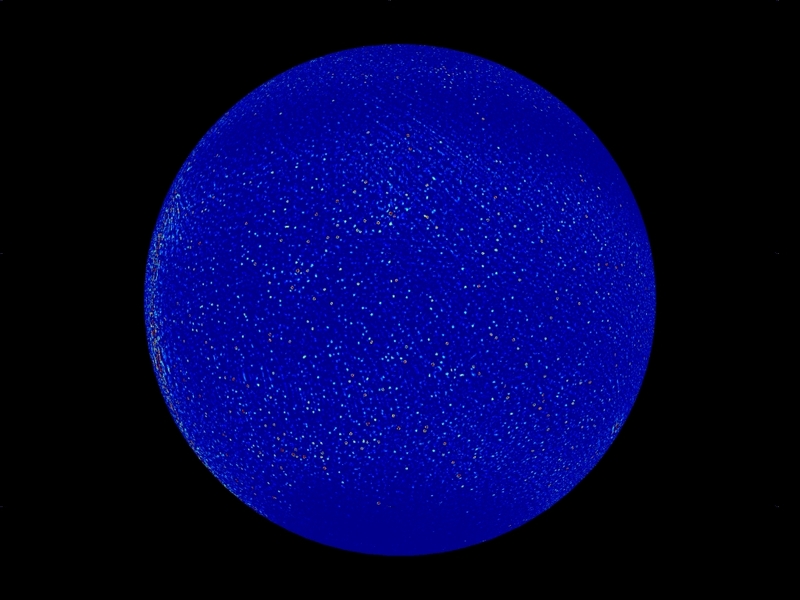 We’ve used data from April and September 2009 to make an image of the sky that covers 30000 square degrees. 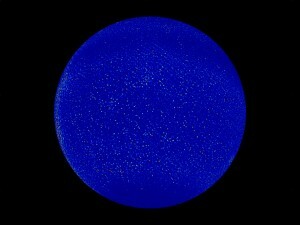 This is more than half of the entire sky! 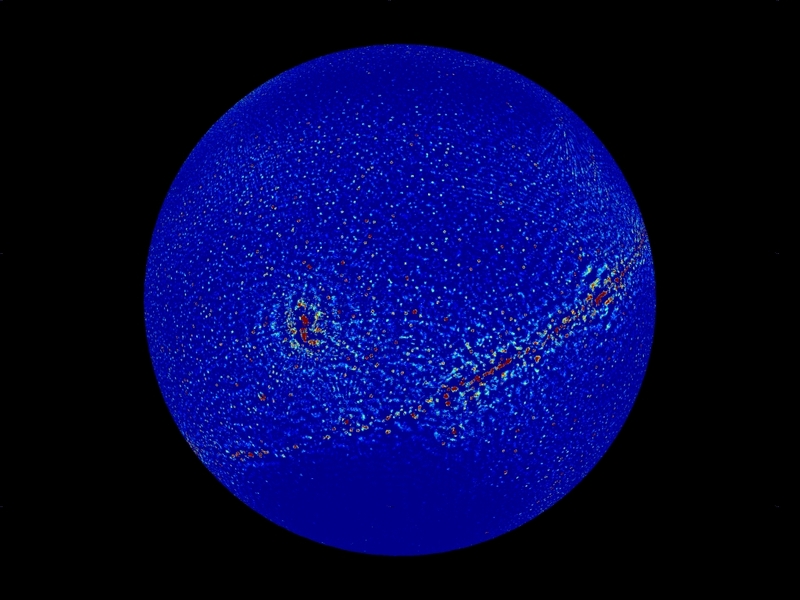 The results, including a list of the fluxes of known sources, are published in the Astrophysical Journal Letters. We found that the fluxes agreed with previous measurements at about the 50% level which is about the accuracy you see when you compare between other catalogs at these wavelengths.